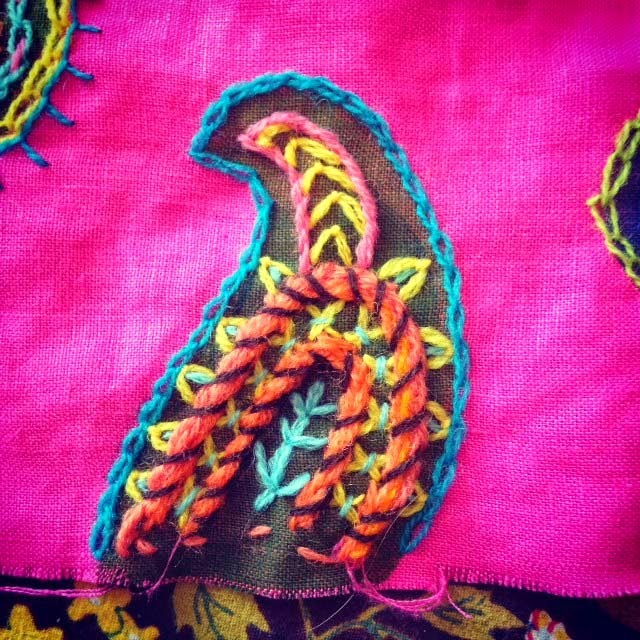 My printed and crewel embroidered paisley piece is coming along. I wanted to share some of the photos of the individual finished paisley motifs with you all. 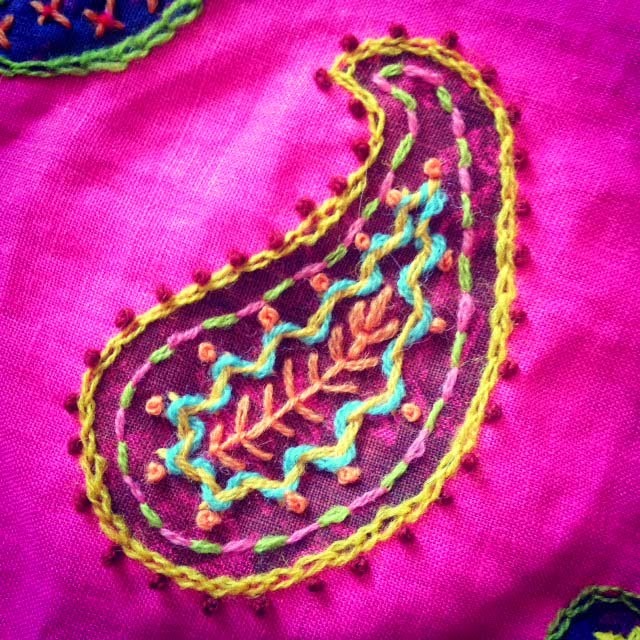 Above each photo, I have given you the stitches I used to complete each paisley motif. You can come to our farm and take a Crewel Embroidery class with me this summer on August 8 and 9. Class is limited in size to 8 people so this is real hands-on with lots of my help. We will have time to do some printing on linen fabric if you want to make a paisley design similar to what I have been making and sharing here on the blog. For this year's classes, I have decreased the price but I will not be serving dinner at the farm. There are so many great places to eat around here that feature incredible locally raised food. The bottom line was that worrying about dinner for everyone on top of teaching was too much for me. But I do throw a very nice lunch spread which will not disappoint, along with nice homemade snacks during the day. Check out all my offerings this year here. The Fabric Printing Class has sold out but I will be adding a second class since it is proving popular. Can't get to our farm - check out my on-line class on Craftsy. See the link on my left sidebar for a special price for this on-line class. One of the reasons this project was so much fun and went quickly was that the paisley shapes were printed onto the fabric before I started stitching. Here is a post with that process outlined. Lots of times, with more typical crewel embroidery, entire solid colored shapes are stitched using heavy stitches such as satin stitch. Stitching on pre-printed shapes defintely makes Crewel Embroidery much more approachable. 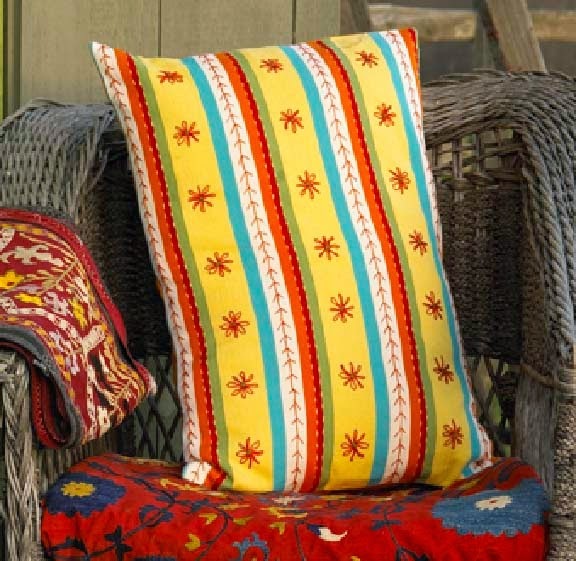 In a recent Martha Stewart Living Magazine, they featured some beautiful embroidered fabrics, using a print fabric as a background. Here is a link to the Flax and Twine blog which excerpted that article from MSL. 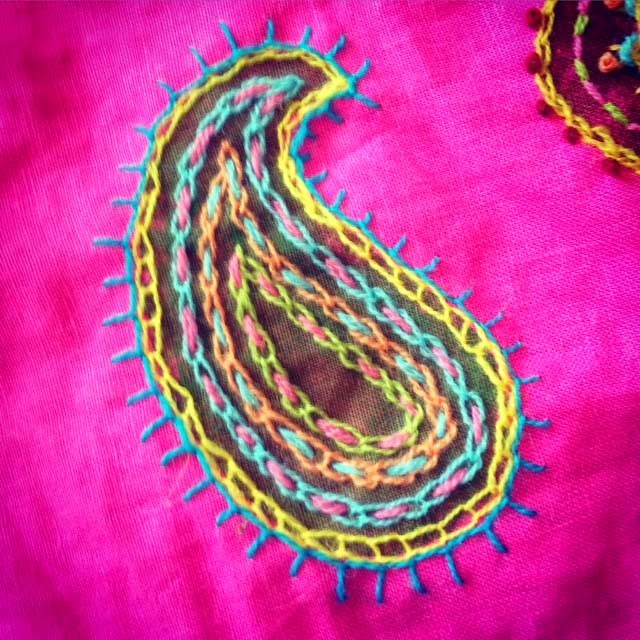 Embroidery certainly is making a comeback! I am so happy that people are picking it up again. Rebecca Ringquist has a new embroidery book coming out which I can't wait to see. 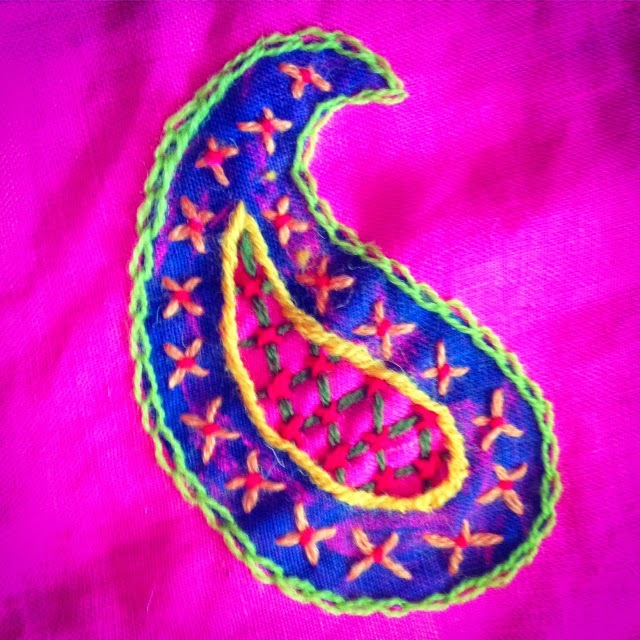 Here is her version of a paisley sampler available via her Etsy shop. Getting *BACK* to doing Crewel & Embroidery "WHEN" I have *time* is still up on my "Crafty"-BUCKET-LIST! - Got TONS of Supplies... [mostly yard sale/thrift store finds] And, have several bits of Fabric [thrift store] that would look even better having their patterns enhanced with some stitchy "texture"! Kristin - What a great idea! I love the paisley print. So cheerful and colorful! You are talented. I signed up for your Craftsy class and am enjoying it. I'm looking forward to using my 2 ply handspun on wool to make a vest. ~ Wonderful detail of the stitches. Paisleys have always been one of my favorites in design. 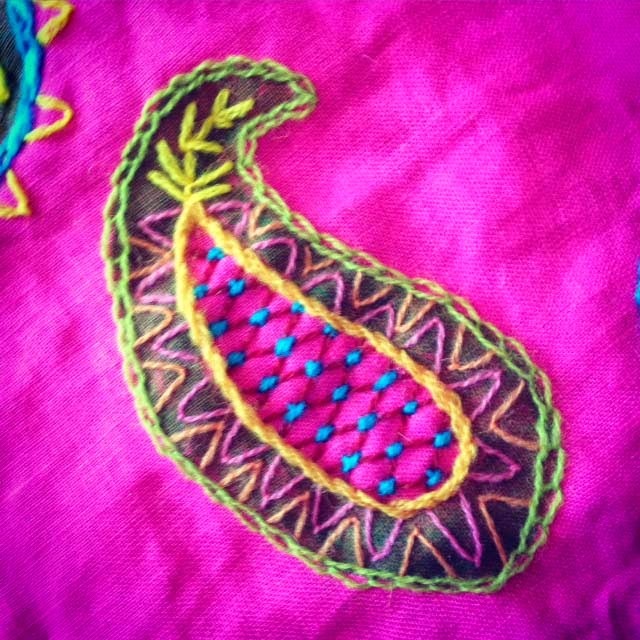 A friend who is just learning embroidery will enjoy your clear, beautiful work.